Animals as Leaders hit a sweet spot with this one. The Madness of Many is rhythmic as hell and stretches deep into the shadows where bands like Tool like to hang out. There are many dark corners in this release which groove like crazy. For a three-piece group, these guys make a surprising amount of sound, and blend together jazz, math and rock in refreshing style. Animals as Leaders really shine when playing choppy, lightning-fast riffs full of energy—and since that’s entirely what this album comprises, it’s a thrilling listen. It doesn’t take long to get familiar with Animals as Leaders’ style. Drums and a hella crunchy bass sound churn out rhythm after rhythm with unwavering confidence. Meanwhile, the lead guitar slays a few bars of solo before quickly changing voices as the verse makes a rapid return. There’s a tremendous amount of energy behind every note that’s played, and the album keeps an impressive pace until ending on a softer note as things get more acoustic around “The Brain Dance.” As a percussionist, this album is exactly my cup of tea—except not tea. The Madness of Many is deeper and darker, like a black cup of coffee that slaps you across the face with strength, then fills you with energy and finally ends with just the right amount of bitter. While most of The Madness of Many keeps a tremendous pace—bringing up section after section and chopping abruptly through fills and solos—I actually found myself most impressed with the outro, “Apeirophobia,” which features a completely different side of Animals as Leaders. Acoustic guitar arpeggios waterfall over each other as the band spins a wistful melody, keeping true at the same time to the somber atmosphere that blankets the album. 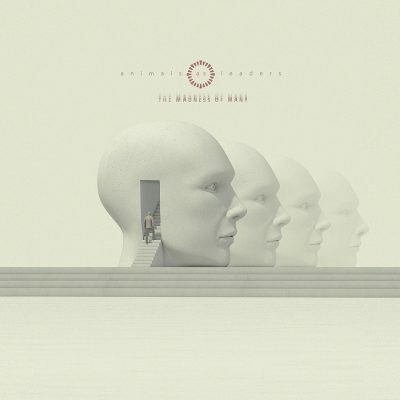 Animals as Leaders weren’t trying to bring warm sunshine and rainbows into this release, but soft clearings of beauty are scattered throughout the heavy grunge that makes up The Madness of Many. It’s not surprising that this is the fourth album out of these guys—they’re rock-solid together. Some of the most impressive movements were the dialogues frequently carried out between the instruments. Most songs sound a lot like a conversation between members of the band—or sometimes more like a shouting match, the best example of which is absolutely “Ectogenesis,“ when the drums and guitar trade bars like they’re trading insults during an argument. Guitar lines fly in and out of the spectrum with speed and intensity while drums hammer out a syncopated pulse—The Madness of Many lives up to its name. Animals as Leaders come across as a whirlwind of chaos. There’s order behind it all, though, and the more I listen through, the more I understand and follow the interweaving lines. Many songs don’t let up on the onslaught of loud, rhythmic churning for even a second—which, while exhilarating, left me wishing songs like “Cognitive Contortions” had a little more of a release, or that softer songs like “Apeirophobia” dotted the album instead of all residing at the end.